It’s difficult to imagine how a comedy as abysmal as The Happytime Murders actually makes it to a theatrical release. First announced by The Jim Henson Company in 2008 and originally slated to begin shooting in January 2011, the long delayed project went through multiple distributors and underwent major casting shake-ups before finally gracing theaters nationwide this past weekend. Troubled productions don’t always result in terrible movies but sometimes, the worst case scenario comes to pass and it’s almost painful to think about how much time and money went into making something this unspeakably awful. The film takes place in an alternate version of Los Angeles in which conscious puppets co-exist with humans but are treated as second-class citizens and pushed to the fringes of society. The story centers around puppet private eye Phil Phillips (Bill Barretta) as he tracks a killing spree that involves members of a past sitcom called The Happytime Gang, including Phillips’ ex-girlfriend Jenny (Elizabeth Banks). When the LAPD gets involved, Phillips teams up with his previous partner from the force Detective Connie Edwards (Melissa McCarthy) to unravel the mystery behind the connected murders. 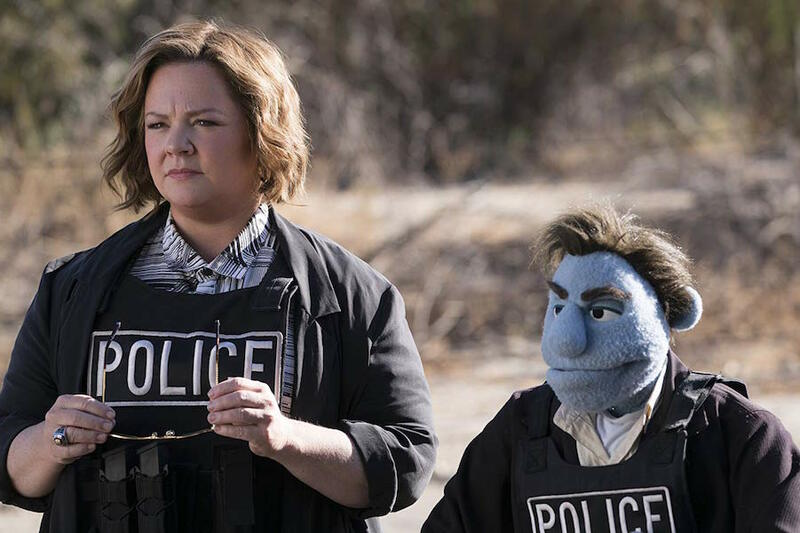 With its hard-boiled detective story and overly profane dialogue, The Happytime Murders clearly aspires to be a combination of Who Framed Roger Rabbit and the Broadway musical Avenue Q, but it’s not nearly as inventive as the former nor as clever as the latter. Given how stale the concept is, it’s not likely that a comedy about potty-mouthed puppets would have yielded great results in any scenario but it doesn’t help that the jokes are as brutally repetitive and aggressively witless as they are here. There’s a certain quiet that tends to accompany terrible comedies like this one, a hush that falls over the audience in the absence of humor, and the silence was near-deafening during my particular screening. It’s one thing for all of the puppet-based gags to be derivative and sophomoric but I’d like to think that the human cast would somehow be able to elevate this material. Sadly, the load is too leaden to lift, as talented performers like Maya Rudolph and Joel McHale are stuck with some seriously lame banter that wouldn’t even pass on a third-rate sitcom much less a feature film. Even Melissa McCarthy, who has seemingly starred in dozens of these types of R-rated comedies since her breakout role in 2011’s Bridesmaids, looks particularly exasperated this time around and doesn’t even try to make the most of her already limited range. But what makes this unfunny abomination that much more unbearable is the knowledge that director Brian Henson, who helmed Muppet classics like The Muppet Christmas Carol and Muppet Treasure Island, worked so hard to see this to completion. He and his crew of puppeteers clearly put loads of effort into bringing life to the 125 puppets that are seen in the film and it’s depressing that their talents were wasted for something that’s so spectacularly unworthy of them. The end credits even bring this point home as they showcase scenes from the film before the performers were digitally removed and we see just how much of their dedication was wasted. The Happytime Murders is brought to you by the letter “L” for lazy, limp and lousy. Operation Finale, starring Oscar Isaac and Ben Kingsley, tells the true story of the capture of Adolf Eichmann by Israeli spies in 1960 Argentina. Kin, starring Jack Reynor and James Franco, is a sci-fi action adventure about a pair of brothers on the run from alien soldiers after they discover an extraterrestrial weapon. Also expanding to local theaters is Searching, starring John Cho and Debra Messing, which is a thriller shown entirely from the point-of-view of smartphones and computer screens.